Hi, I can't find the Colecovision emulator, where is it?? Copy the 'Databases' and 'Machines' folders described here and put them into the system folder path above. In the folder game.libretro.bluemsx/, I had to create the resources/ folder and then, the system/ subfolder. I don't understand how can I run the emulator or a game in Kodi. In the addon info, "run" is greyed out. Where can I find col files and where do I have to put them? Run is greyed out for BlueMSX (and many other game addons) since they can't run without content. Some of them, like DOSBOX, can run without content. Colecovision is included in IAGL, so you could play them using that. Or, if you want to have all the games/files locally, then an internet search will get you what you're looking for. The game files can be wherever you want them to be on your local computer. Hello Zach, thanks for the help again! I found some col files. If I put them all in c:\games\colecovision, how can I tell the BlueMSX addon to use this path? Games play just like video or audio files, but use the game emulator addon as the 'player'. The only difference at this point between the games and video/audio sections in Kodi (that I can tell anyway) is that there's no library capability yet, so it's just browsing files at this point. Enter the games section on the Kodi home screen, then select "+ Add games", then browse to your folder with the game files and add it as a source (just like you would add a video or audio source location). After the source is added, from the Kodi games section just browse to that source, choose a game file, and it should play just like a video (but with the game addon instead of the video player). Kodi is smart enough that if it sees more than one emulator addon capable of playing a type of file it will ask you which one you want to use. 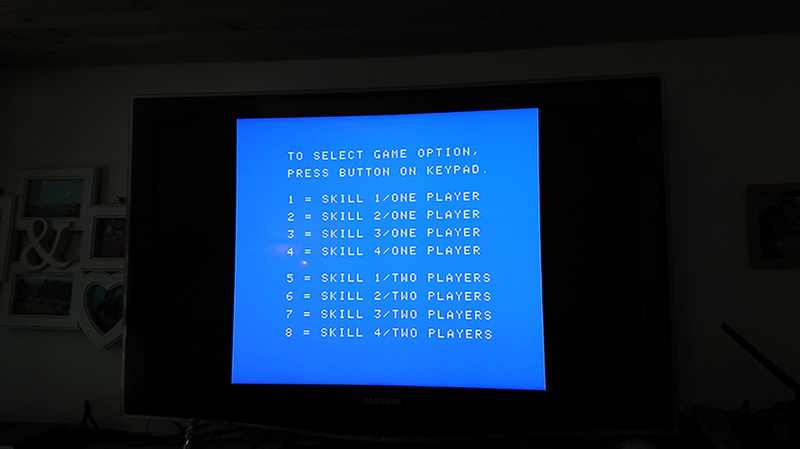 Ok it was very simple: I just had to press enter when the game menu in the left side of the screen was highlighted! Then I added my fodler. I use Kodi on a Windows 10 PC. My keyboard is french without a numpad. So I tried the normal numbers button. On an azerty keyboard, they work with SHIFT. But this didn't work. Then I tried the Windows on screen keyboard's numpad, didn't work. So I was wondering, perhaps I need to map the colecovision joystick's numeric buttons to some buttons on my Xbox One controller? But how do I do that? In Kodi, the default controler is enabled , the colecovision controller is enabled and I have 3 more controlers that installed themselves with the BlueMSX addon. I read the Wiki but I still don't understand how to set this up. Well I gave it a try and I couldn't get it to work either. I'm guessing there's some bug in the colecovision controller mapping, so I opened an issue for it. Keyboard works, it just can't emulate a joystick. If the core asks for keyboard input, it should get it. BTC: 1JtXwJdGdE9YnYgThWBT2StFCU5sEYkbVD (personal), https://kodi.tv/contribute/donate-bitcoin (foundation). Donations in the form of controllers, especially ones that don't work in Kodi, are also appreciated. (2019-02-15, 20:02)audreyspency Wrote: I found some col files. If I put them all in c:\games\colecovision, how can I tell the BlueMSX addon to use this path? I believe that was answered right in this very thread... look up. In this case, the coleco controller isn't a keyboard. It's a weirdo controller with keypad. When I try and map the keypad buttons to a controller, they don't seem to register in BlueMSX currently. Yes but the BlueMSX emulator is waiting for keyboard inputs. I use Kodi on my HTPC which has a french azerty keyboard without numpad. It also has 2 Xbox One wireless controllers. I also have a desktop PC which has a full french azerty keyboard. It does not have a game controller. I installed the full BlueMSX emulator on my desktop, not the Kodi addon, the full program. I started to play Donkey Kong and when I reached this blue screen asking for number input, the keyboard was working fine: the normal number button, under the functions keys, using the SHIFT key, were working. The numpad number button were working too. So then I was able to play Donkey Kong on my desktop, but I'd like to play on my HTPC with the Xbox One controllers.